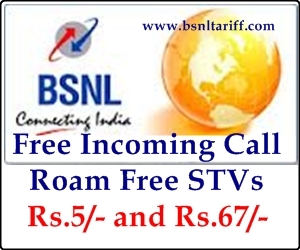 Leading Telecom Operator Bharat Sanchar Nigam Limited (BSNL) has introduced two new Special Tariff Prepaid Roaming Special Tariff Vouchers (STVs) across Himachal Pradesh Telecom under GSM Mobile Services. The BSNL Competent Authority of Himachal Pradesh launched two new Special Tariff Vouchers (STVs) of Rs.5/- and Rs.67/-. The Special Tariff Voucher of Rs.5/- offers, National Roaming Voice Local/STD Outgoing Call Rates 1.5/sec and Incoming Call ‘0’ (FREE). The Special Tariff Voucher of Rs.67/- offers, National Roaming Voice Local/STD Outgoing Call Rates 1.5/sec and Incoming Call ‘0’ (FREE). All other charges will remain as per existing base plan. The above Special Tariff Vouchers will be implemented and with effect from 15-07-2013.